Sometimes it’s the simplest things in life that bring the greatest pleasure. With no more than one egg, a slice of bread, and a dab of butter, you can make a breakfast that satisfies salt, fat and carb cravings in one fell swoop. Start by dipping the crisp, butter-soaked toast center neatly into the warm, golden yolk for a perfect first bite, or save it – for the last joyful crunch. You may know Egg in a Nest by another name. The list is quite long: Toad in a Hole; Egg in a Basket; One Eye; Birdie’s Nests; One-Eyed Egyptian Mummies; Rocky Mountain Squattled Eggs; Gas House Eggs; Cowboy Pancakes… who knows? Perhaps you call it something else? Such an uncomplicated dish easily lends itself to all sorts of variations – serve it over a bed of wilted greens, or top with a slice of Canadian bacon. Melt some Swiss cheese on top of the egg near the end of cooking, or sprinkle with a dash of parmesan. 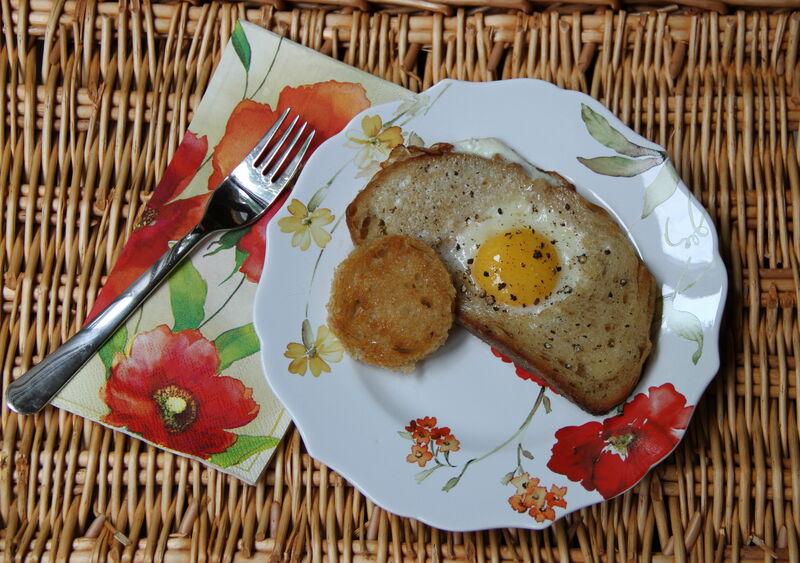 Or just keep it plain ala Claudette Colbert for a simple breakfast in bed. Melt about 1 tablespoon of butter in a large, heavy pan over medium heat. 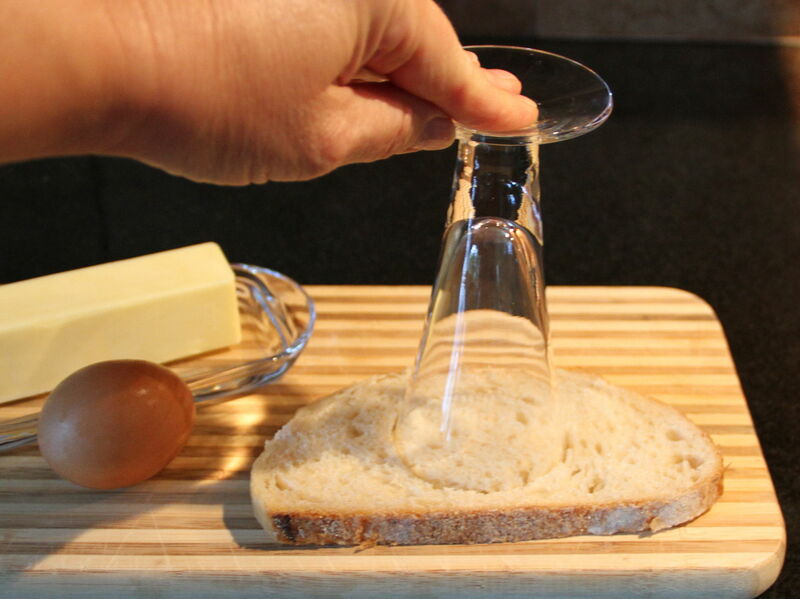 In the meantime, cut a round hole in the center of the bread using a knife, cookie cutter or the rim of a glass. Place bread and cut-out center in pan and toast to a light golden color, about 1 minute. Flip bread and round center, adding more butter as needed. 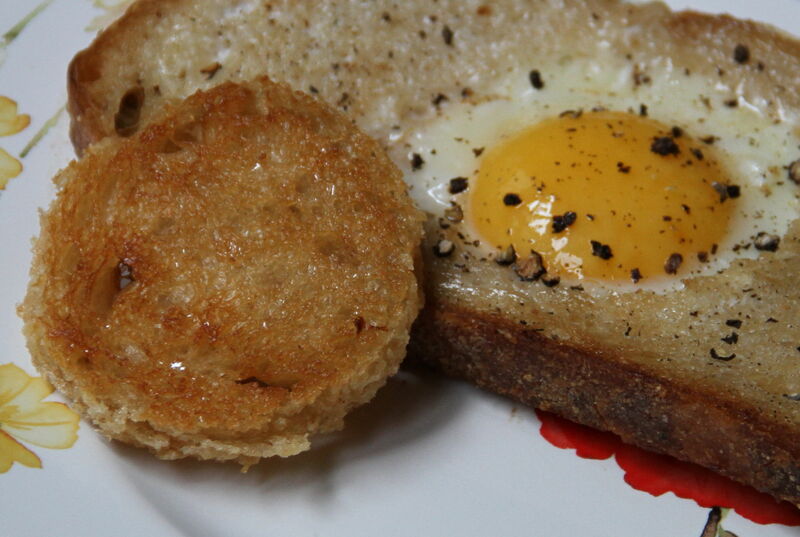 Crack egg into center of bread slice and reduce heat to medium low. Continue to cook, another 1 to 2 minutes. When egg white is almost set, cover the pan with a tight-fitting lid to finish, about 1 minute longer. 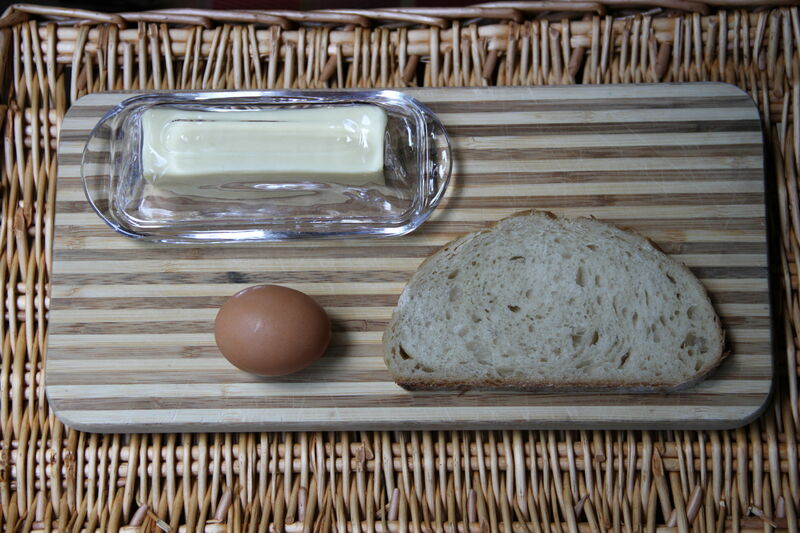 If you prefer, you may choose to carefully flip the bread / egg combo for an over-easy egg. Season with salt and pepper and serve immediately. “I am the Lorax. 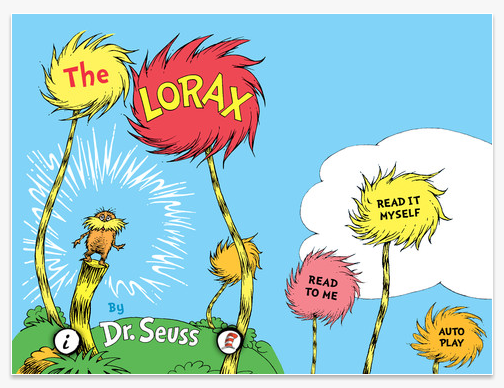 I speak for the trees.” Those are the famous words uttered by the squat mustachioed thing in the beloved and at times controversial book, The Lorax. Believe it or not, despite my identity as a father and a children’s librarian (at heart, if no longer in practice), I only read this for the first time last week. SPOILER ALERT: It’s kind of depressing! This greedy guy with a desire to build useless junk nobody needs cuts down every darned tree in the land. All the birds fish and bears who relied on the trees must necessarily leave and find somewhere with a more suitable habitat, leaving this land drab and dead. And not even economically sound in the end! It’s a pretty straightforward moral lesson about our role as stewards of the earth, and about greed, and about money before the health of the environment. I appreciate the importance of teaching kids the importance of the world around us. It was clearly an important theme to Dr. Seuss. This book has none of the joy, silliness, and oddity for which he is so well known. It’s just dark, and upsetting, and sad. It ends, of course, with the single seed from the last Truffula tree, which is supposed to mean hope for recovering from all of man’s destruction. It would have been nice to maybe show the trees growing back, the fish returning, something like that. That’s my favorite part about watching nature recover from disaster. Anyways, I think it’s a good lesson to share, but I’m not reading this one every night for days on end! I am not generally a fan of action, explosions, running and car chases in crowded foreign cities. My main exception to this has been USA Network’s “Burn Notice”. This show I classify as laundry-folding entertainment. But what do you do when faced with piles of laundry to fold and you’ve burned through all your Burn Notice? The answer: compromise. I never saw the first two (ed. note: apparently there were three before this) Mission Impossible movies, nor did I ever feel very compelled to do so. 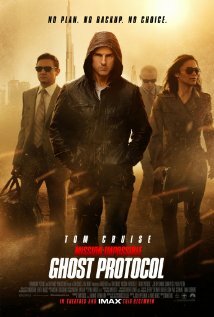 Not surprisingly, there is no need for knowledge of the back story to understand what is happening in Ghost Protocol. Here’s what is happening in Ghost Protocol: explosions, running, and car chases in crowded foreign cities. It even comes with the requisite driving through some Arab vendor’s tent! Also: Simon Pegg as the witty element (which mostly falls flat) and physically impossible feats like not having your shoulder dislocate when falling from a considerable height and catching yourself at the last moment. In short, this is perfect laundry-folding entertainment. So long as you are not too hung up on plausible plot points or well-crafted dialog, it’s worth the free price on some of the streaming channels. Choosing the right pillow can be a timely and expensive endeavor, roiled with many restless nights’ sleep. That is, until you find the right one. I personally have a closet of pillows that don’t quite work for me; a constant reminder of the work I’ve done (and money I’ve spent) in pursuit of bedtime nirvana. To help expedite your search for the best pillow, I’ve gone over some of the basics of choosing the right pillow in a previous post right here on the Charles P Rogers blog. That post details some of the basics of pillow construction, and the general types of pillows that are best suited to your sleep style. Once armed with that knowledge, the only thing left is to go to test out a bunch of different pillows in person. This can be a tiresome task, especially if your current pillow hasn’t been giving you the best night’s sleep. 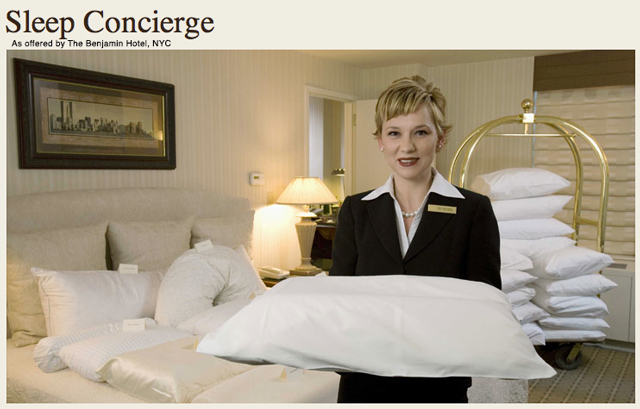 However, there may be a shortcut to your pillow hunt if you find yourself staying at New York City’s Benjamin Hotel. A quick review of their website, and you’ll find that The Benjamin holds sleep paramount. So much that they offer a sleep guarantee, which promises, “you’ll sleep just as well at The Benjamin as you do at home, or we’ll give you a free night’s stay.” This is a pretty bold statement for a hotel in the middle of the city that never sleeps, though you may discover that you’ll sleep better at The Benjamin than you ever have at home thanks to their robust sleep program. The sleep guarantee, however, is merely a backstop to The Benjamin’s full sleep program. At the forefront is the pillow menu: a selection of 12 pillows ranging from a 5-foot body cushion, to buckwheat and hypoallergenic pillows, all the way to water-filled pillows. I’ve never tried a water pillow before, but am intrigued by the idea. You can view the complete pillow menu here. 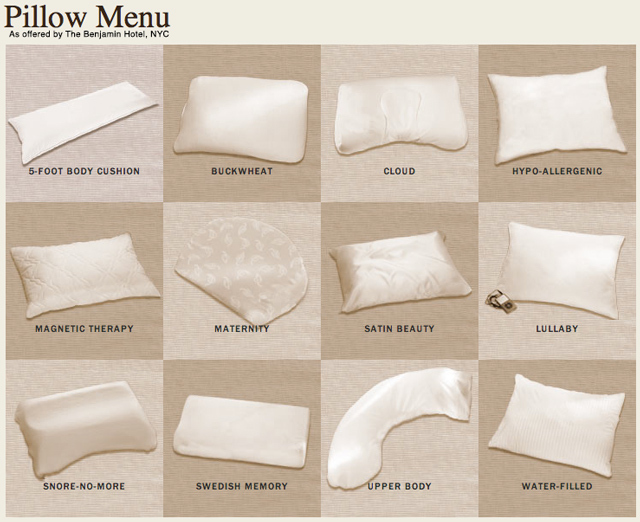 And if you’re having trouble making a selection from the pillow menu, there is even a dedicated sleep concierge to help. The sleep concierge will assess your sleep habits, recommend one of the pillows from the menu, and even send up bedtime snacks or schedule you for specific spa services that can help you achieve the best night’s rest you’ve ever had. Wow! In any case, I think the idea of a pillow menu is a pretty cool, especially if you have yet to find the perfect bridge between your head and the mattress. Throw in snacks and customized sleep programs, and you’ve got all the ingredients for a great night’s sleep. I also wonder if there are companies that provide personalized sleep assessments in your home – a sleep consultant? I know I’d be game to give them a try, especially if the service came with a guarantee! Spätzle, or “little sparrow,” is a hand-cut egg noodle from the region of Southern Germany, Austria and Switzerland. I love spätzle fried in butter, liberally salted and peppered, and browned to a crisp perfection. Topping that with a gooey poached egg and specks of fresh parsley nearly sends me into a dreamy food delirium. Making these eggy little pasta bites is easy – no need for fancy contraptions. My Austrian grandma taught me to make them with nothing more than a knife and spoon. Be careful as you gently push your thin globs of dough into the boiling water – wear gloved potholders, if you like, to be safe. Fry them with bacon or onions, bake them with Swiss or Gruyere, spice them, sauce them, herb them but definitely serve them – for lunch, for dinner, or for a joyfully delirious breakfast in bed. To make spätzle, mix flour and salt together in small bowl. Whisk in eggs until smooth, thick batter forms. Gradually add water until you achieve the desired consistency. The batter should be somewhat thick, but thin enough to slide slowly off the edge of a spoon. Bring a large pot of salted water to boil. Scoop up a tablespoon of batter with one hand and hold over the boiling water. In the other hand, hold a butter knife parallel to the spoon, and gently (and carefully) push the strip of dough into the water. Repeat the process. As the spätzle cook they will rise to the surface. Skim them off and place in a separate bowl. When all the dough is gone and all the spätzle are cooked, rinse them in cold water and allow them to drain. Makes about 2 cups of spätzle. When ready to eat Spätzle mit Eier, melt the butter in a heavy saucepan over medium heat. Add the spätzle and cook until lightly browned, stirring occasionally, about 10 minutes. To poach eggs, fill a heavy saucepan with enough water to cover eggs (3 to 4 inches) and heat until very hot and simmering, but not boiling. Break eggs into individual small dishes. Or you can use an egg poacher. Carefully pour the first egg into the simmering water. Immediately use a wooden spoon to wrap the cooking white around the egg yolk to prevent the white from feathering. Repeat the process with the second egg, and cook for about four minutes, until the white is firm but the yolk is still soft. Remove from pan with a slotted spoon and drain. Trim edges if necessary. Divide the spätzle into two equal portions. Top each portion with a poached egg. Add salt and pepper and garnish with chopped parsley. Serve immediately.